Baruchel at Joint Base McGuire–Dix–Lakehurst, 2014. 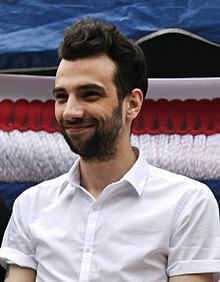 Jonathan Adam Saunders "Jay" Baruchel (born April 9, 1982) is a Canadian actor and screenwriter. He has appearded in the well-known movies Million Dollar Baby (2004), Knocked Up (2007), Tropic Thunder (2008), The Trotsky (2009), Fanboys (2009), She's Out of My League (2010), How to Train Your Dragon (2010), The Sorcerer's Apprentice (2010) and This Is the End (2013). Baruchel was born in Ottawa, Ontario. He grew up and still lives in the Notre-Dame-de-Grâce neighbourhood of Montreal, Quebec. He is of is French, German, Irish and Jewish (Sephardi) ancestry. He was engaged to actress Alison Pill from 2010 to 2013. He is an agnostic. He appears in the two short films entitled 'The Watchmaker' and 'The Office of the Watchmaker' on the Canadian Band Rush live DVD/Blu Ray of 'Clockwork Angels Tour' released in 2013. The films were shown at the intermission and at the end of the concert. ↑ "Jay Baruchel says he adores living in Toronto". ↑ "Jay Baruchel talks about why he's high on Hogtown". ↑ Archibald, Monty (March 5, 2013). "Tropic Thunder star Jay Baruchel is 'dumped' by Newsroom actress fiancee Alison Pill". Daily Mail. Retrieved March 16, 2014. ↑ "Creator: Jay Baruchel". TV Tropes. August 23, 2013. Retrieved March 16, 2014. Wikimedia Commons has media related to Jay Baruchel.